September 15, 1944. “As had been anticipated, the Japanese reacted violently as soon as they were able to recover their balance. The first and most vigorous manifestation began at approximately 1650: a tank-infantry sortie in force across the northern portion of the airfield. This was not a banzai charge in the usual sense of that term, unless the peculiar conduct of some of the tank operators could be so construed, though the end result proved suicidal enough to satisfy the most discriminating devotee of Bushido." – Major Frank O. Hough, USMC. We stayed in the crater. Our advance had halted. There had been many casualties. The defenders were resolute and resourceful. 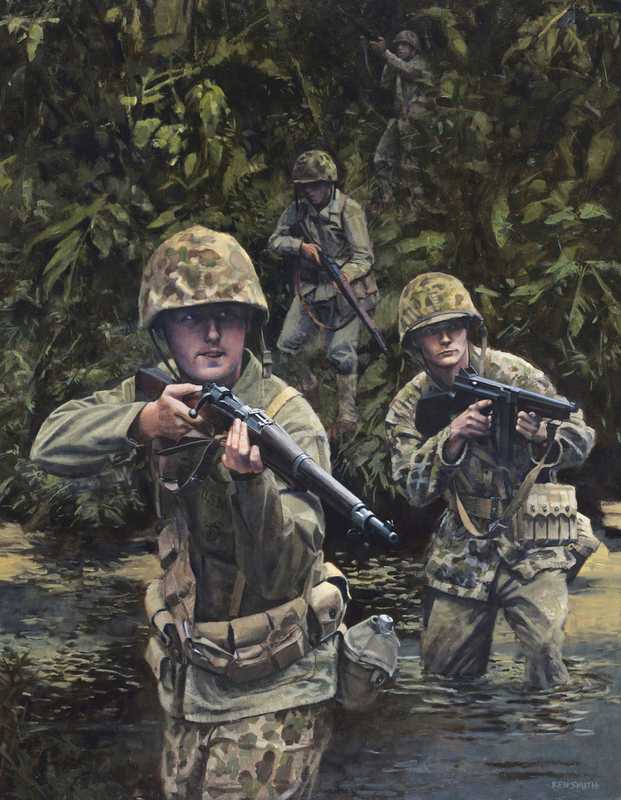 The marines began to chip foxholes in the airfield coral. At noon I tried to eat, but I could not swallow even a mouthful of beans from the ration in my pack. I never ate on Peleliu. Their tanks swooped suddenly upon us. They came tearing across that airfield, a dozen or so of them. It was startling. 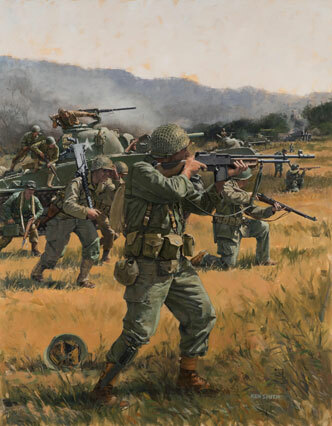 They came out of nowhere, and here were only riflemen and machine-gunners to oppose them. There was a violent outburst of gunfire. I poked my head above the crater. Through the lacy branchwork of the scrub trees I saw an enemy tank streaking along, with snipers in camouflage hanging onto the rear. It was but a moment's glance, but at the same time, my eye caught sight of a marine from F Company, a veteran, running bowlegged to the rear, his face writhing, shouting, "Tanks! Tanks!" An officer grabbed him and spun him around and kicked him and propelled him back to his post. In the crater, we prepared for defense, like a caravan attacked by Indians. The enemy tanks whizzed past, their little wheel s whirling within their tracks. Machine guns clattered, bazookas whammed—our airplanes came screeching down from heaven, and there rose the detonation of their bombs and the roar of exploding tanks. Once a torpedo plane flashed by, so low its belly might have scraped the coral. To my right, I saw a line of our tanks advancing, firing as they came, seeming to stop each time their guns stuttered. Then it was over. The Jap tanks had been destroyed. I got up and made for the airfield. About twenty yards away was a burning tank. Some of the enemy dead were inside. The snipers hung in their nets like dolls stuffed in a Christmas stocking. I turned to go, and as I did, nearly stepped on someone's hand . "Excuse me," I began to say, but then I saw that it was an unattached hand, or rather a detached one. For multiple print orders, please email us to significantly reduce shipping costs. For orders outside Continental US, please email for shipping costs. The ORIGINAL ARTWORK OF HA-GO BANZAI IS AVAILABLE FOR PURCHASE.